Whilst it may seem a bit premature and ambitious to be attending an event like this as a Foundation Dentist, it was great to learn more of the business side of Dentistry which is totally skipped at Undergraduate Level. I also dragged my boyfriend along to the event, but it wasn't such a bore for him since he is studying to become a Lawyer! Here is a summary of what I've taken away from the event: a brief introduction to those like myself, who before going to this event, would not have a clue about how to go about setting up a Dental Practice. 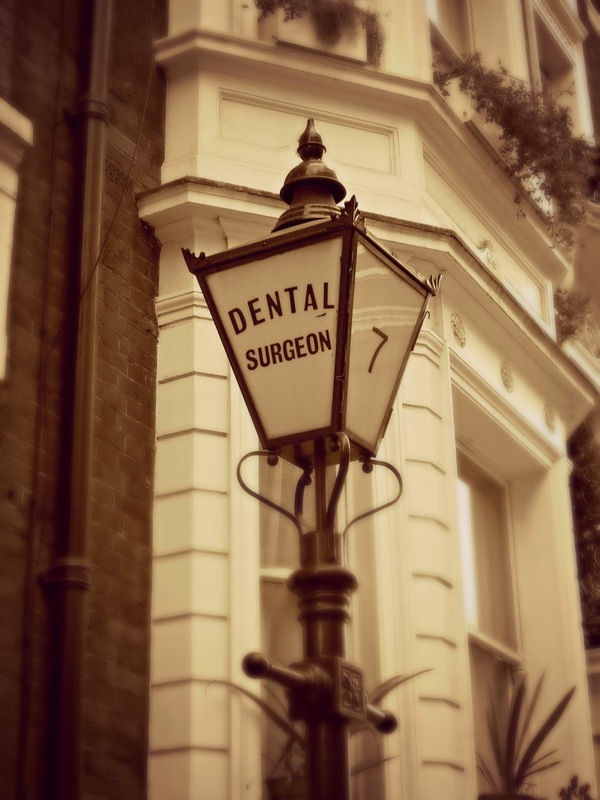 What do I need to take into consideration when buying a Dental Practice? Well there is an endless list of general things you should think about. Like most big decisions in your life the usual questions like why do you want to do it, can you afford it, how will you finance it, will you have enough time etc should run through your mind. What type of Practice is it? Purely NHS, purely private or mixed. In terms of NHS practices, you then need to ask if they have a GDS (general dental services) or PDS (personal dental services) contact. It is relatively easy to add or change people on a GDS contract, but for PDS contracts you will have to ask the NHS's permission or change the contract to a GDS one; however, the NHS can then renegotiate your contract value (more often than not, downwards). For private practices, or for the private work of a mixed practice, you can change owners through the limited (ltd) company quite easily. On average, buying an NHS Dental Practice takes 4-6 months but it can take longer if you need to register with the CQC (a legal requirement) or if there is a third party landlord to deal with. This is an appraisal of the business of the practice which your lawyers should undertake prior to you buying a practice in order to establish the practice's assets, liabilities and evaluate the business i.e. making sure you are making a good investment. Due diligence for a dental practice will be looking at things like the profits, patient numbers, types of patients, equipment and furnishings of the practice. Your lawyers should also place warranties or policies in the contract to deal with faulty equipment, partially completed treatments, lab bills and guarantees on previous treatments. There should also be clause to prevent the seller from setting up a practice nearby and poaching your patients (usually they can't set up a practice within 5 miles for 1 year after selling). Whilst it's attractive to have the Freehold (i.e. to own the bricks and mortar as well as the business), Leasehold may be the more appropriate option because it's cheaper so you can buy more businesses in the long run! Just make sure you check how much time there is left on the Lease! Who wants to buy Dental Practices in the UK? There are 4,182 dentists registered with Frank Taylor and Associates (just one of the Dental brokers) who are looking to buy a practice in the UK. This is a staggering figure that shows the huge competition you're up against if you're looking to buy a practice - especially in popular areas such as London! Despite the belief that corporates such as IDH or Oasis are buying up everything, they actually only account for 8% of the dental market. Whilst corporates are looking to buy, especially since they can now buy unlimited numbers of practices (read here to see why), Principals are not keen to sell to them. There has been a recent emergence of the Entrepreneurial Dentist during the past few years, with some individuals owning up to 12 practices! It has been estimated by FT&A Finance Services that these individuals make up about 12% of the marketplace today. That leaves around 80% of the competition left, who are individual or small partnership ownerships that are looking to buy. All of your experts need to be Dental Specialists, otherwise problems can arise! So what makes a successful Practice? Set out a business plan early. And don't be afraid to change it regularly. Set your goals so you know what your targets are. Throw yourself into your business, work with others who have the same vision as you. Work hard but don't forget there is a life outside of your practice! In the end, it matters less how many patients you get through your door, it's how many you come back. Customer service is key. The best way to advertise to new patients is by the personal recommendations by other patients so focus to delivering excellent care. 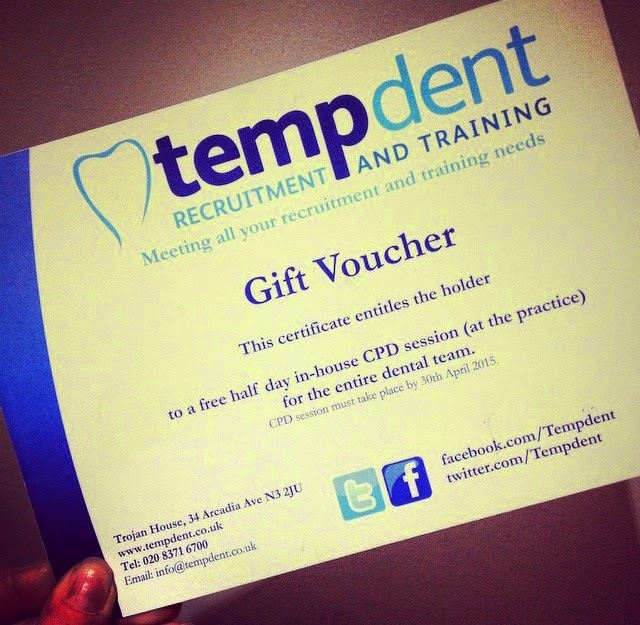 I'd also like to mention TempDent a Dental Recruitment Agency, who also attended the event and held a prize draw which I actually won! I don't think I've ever won a draw before so thanks every much, I'm sure the other staff members of my practice will be chuffed with some free CPD! See my post about the Safeguarding CPD afternoon we had here. The main message I took from the evening was that in order to have a vision and build an effective business plan, you need experience! You need to know what you love doing and where you'd like to be in 5 years! Having only worked in practice for 3 months, I've got a long while yet before I know where my career is heading! I'll keep you posted! Has anyone got any other tips for people thinking of buying a Dental Practice? Please leave your comments in the section below!